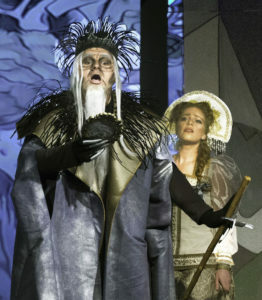 In a surprisingly polished pair of performances, Island City Opera, Alameda’s resident opera company, opened two one-act operas by Nikolai Rimsky-Korsakov last Friday, Jan. 19. While known for his powerful use of orchestral color and deep sympathy for native Russian folk themes, Rimsky-Korsakov wrote these two operas in very different styles. Mozart and Salieri, composed to a libretto by Alexander Pushkin, offered the idea that the composer Salieri actually did poison Mozart, much as the movie Amadeus suggested, rather than the generally accepted notion that Mozart died from heavy-metal poisoning, perhaps as an attempt to cure syphilis. Anders Fröhlich and Darron Flagg; courtesy of Island City Opera. Even in Rimsky-Korsakov’s day it was not widely credited, but was rather a fascinating way for Pushkin to play with the idea of fatal professional jealousy. In the pot-boiler that was Russian composing at the end of the nineteenth century, with its tight cliques and denunciations and back-stabbing, a professional jealousy that would result in murder may have seemed almost natural. And musically, this opera describes those “armed” camps perfectly. The composer Salieri, displaced by Mozart’s rising star, was sung with conviction by Anders Froehlich. In a suave and stately baritone, he described how carefully he trained and composed. “Then I built an Algebra of Harmony,” he sang (and this opera was sung in English). Mozart, sung by Darron Flagg in a comedic tenor, was off-hand and inspired, and his harmonies were more daring. At one point he brought a blind violinist to play for Salieri, and the street musician plays Mozart’s own composition, “Voi Che Sapete” from the Marriage of Figaro. But Rimsky-Korsakov used grating double stops here to mimic a beginner’s floating sense of pitch, a lovely modern riff on a classical colossus. Flagg then tells Froehlich that he thought of a lovely melody that turns to darkness, and plays a disturbing piece (skillfully played by Jonathan Khuner), that began with Mozartian simplicity and lilting counterpoint and then tilted into wild thunder. There is Wagner here, and Liszt, and some of the disturbing bass that we encounter at the opening of the next opera. It is, indeed, a sense of where Mozart may have gone if he lived a full life. It also reflects how Rimsky-Korsakov’s exposure to Wagner’s Ring Cycle expanded his own sense of harmony. After intermission was Kashchey the Immortal, written five years later and sung in Russian. Eileen Meredith, one of the founders of Island City Opera, announced that this was the first time that this opera was being heard in America, despite its popularity in Russia. Silvie Jensen and Igor Vieira; photo courtesy of Island City Opera. They did it full justice. The voices were mesmerizing, the staging adroit, the sets and costumes mythic and the music riveting. Lidiya Yankovskaya conducted 24 excellent musicians with deep feeling, flair and an exacting edge. Here she revealed the flowering of a composer who began with strict Western counterpoint, then reveled in the pagan roots of Russian folk music and exotic orientalism, and flavored it all heavily with Wagnerian progressions and a heavy use of leitmotifs. It was a thrilling ride into a fairy-tale realm, grabbing us in our brain stems where fear and need and beauty mixed together like the magic poppy potion that Kashcheyevna, the daughter of the evil Tsar, gives to Prince Ivan to make him fall in love with her. Whew! And the voices! That daughter was sung by Silvie Jensen in a bright and penetrating melancholy, slow descending arpeggios turning in and out of the minor. But when she began to whet her sword on a grinding wheel to stab the Prince her voice turned to exquisitely sharp gestures. His prisoner, the lovely Tsarevna, was sung by Rebecca Nathanson in one of those voices that is technically a soprano but filled with such dark and dreamy lights that it could be described as a chocolate malted mezzo. That rich burr added to her own slow descending signature, the anguish of Spring held captive by the bite of Winter. Igor Vieira was a smooth baritone as the Prince, adding a touch of classy velvet to his duets, and Bojan Knezevic embodied the contrary North wind as Burya-Bogatyr, a bass-baritone with a larger-than-life voice and eyes that glowed with madness. Adding to that great cast were sets and costumes that were outlandish and even a little cartoonish, making this strange land more believable. Patrick Kroboth designed both, and as well crafted panels of hand-written scores for Mozart and Salieri that propelled us into that careful world, breaking free of Baroque. And to be clear, these were sets without curtains designed to be dismounted easily in the multi-use ballroom. The icing on the cake was a strong chorus that stood along one wall. Harp swirls gave us a portal from one dream to the next, and the chorus chided us and tolled our doom like the voice of an ancient village. That chorus was also excellent in the first opera, when Salieri is reading through the manuscript of Mozart’s Requiem, and the chorus intoned those immortal final notes that Mozart wrote before his death. Directed by Richard Bogart, the action was smooth and snappy. After the success of this opera, there will undoubtedly be other opportunities to hear this in the U.S. But rather than take a chance, I do urge going to one of the two remaining performances this weekend, on Friday, Jan 26 at 7:30 and on Sunday, Jan. 28 at 2:00 p.m. at the Elks Ballroom, 2255 Santa Clara Avenue, Alameda. Tickets are available through the website at islandcityopera.org, or by calling the box office at 510-263-8060. 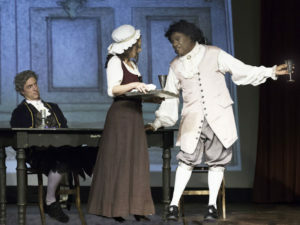 Photos, from top: from left, Anders Froehlich and Darron Flagg in Mozart and Salieri. Below, Silvie Jensen and Igor Viera, and bottom, Alex Boyer and Rebecca Nathanson, in Kashchey the Immortal. Photos courtesy of Island City Opera.